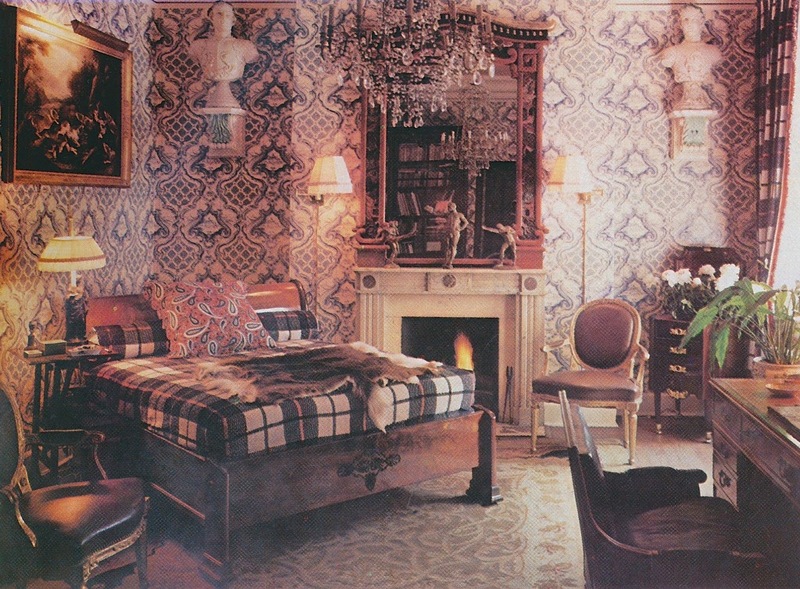 Those of you who own a copy of The New York Times Book of Interior Design and Decoration are probably already familiar with the former Manhattan townhouse of designers Robert Denning and Vincent Fourcade. 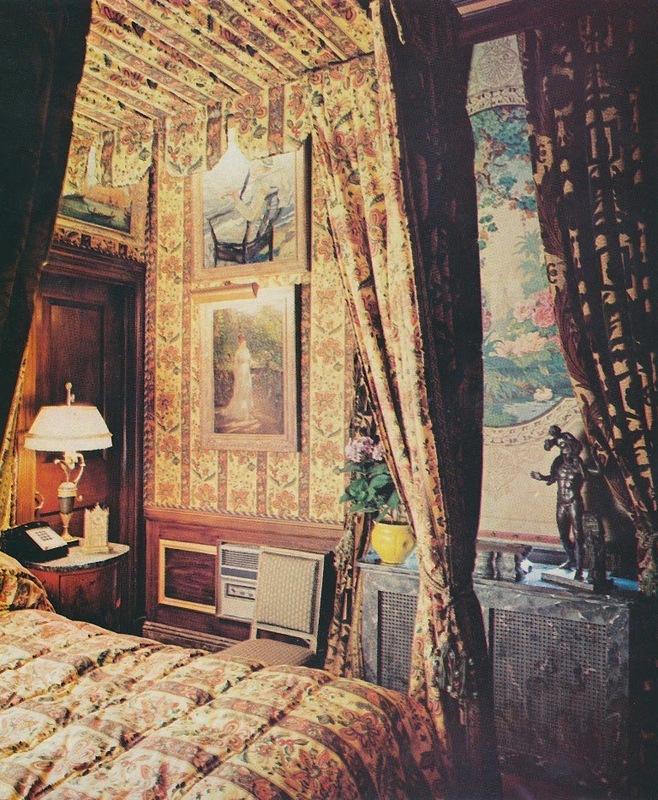 Their residence, which was decorated in the designers' signature opulent style though mixed with touches of late 1960s-era hipness, garnered four photographs in the New York Times book. And if memory serves me correctly (though it may not,) I believe that the designers' master bedroom may also have appeared in a House & Garden book. And now thanks to a kind reader who lives in Geneva, I have many other photos of this townhouse, which I had not previously seen. Although the Denning and Fourcade look is usually a bit too rich for my taste, I do think that there is much to appreciate about their work. Take their townhouse, for example. There is no denying that the two designers possessed some fine-looking furniture and employed fine-looking fabrics. Their master bedroom, which is memorable for its blue and white patterned walls and plaid curtains and bedspread, is appealing, despite the fact that the bed is placed diagonally within the room. 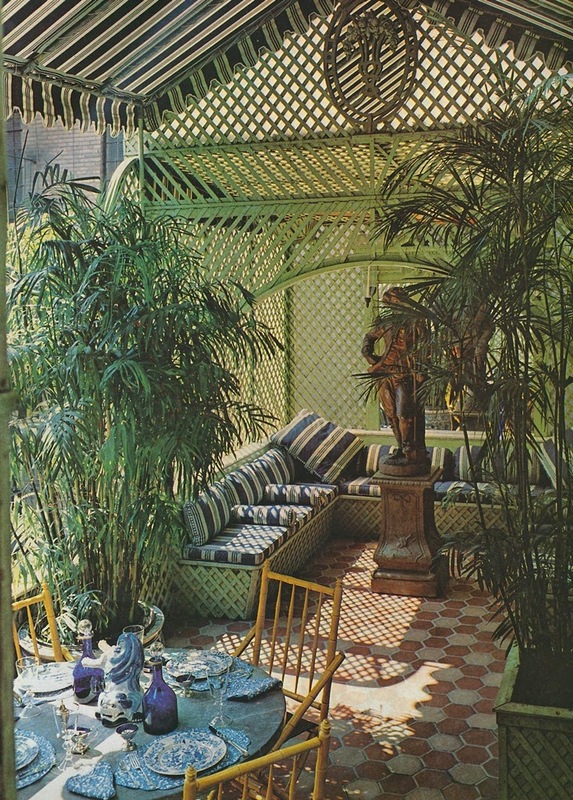 And their patio is positively timeless-looking, what with that abundance of green trellis and blue-and-white-striped fabric. 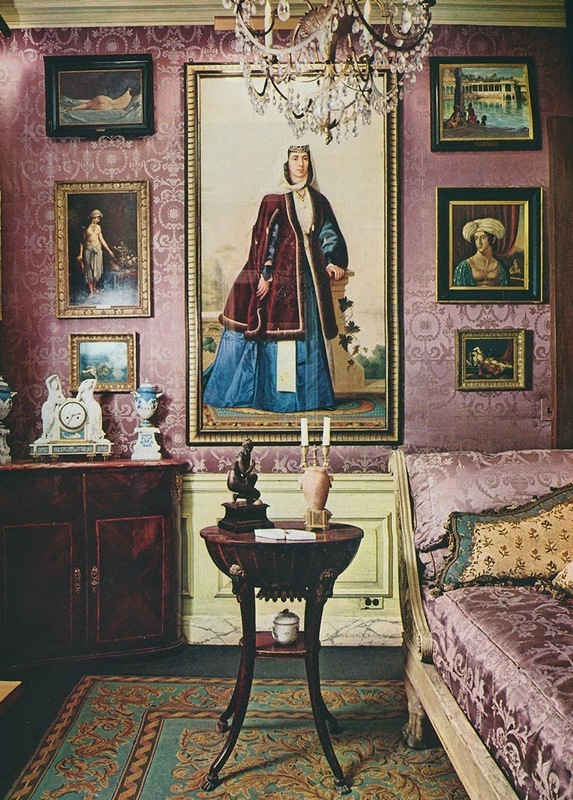 Although few people live like this anymore (which, in a way, is a shame,) it's worth taking a look at the residence of two men who lavishly made their mark on American design. It's interesting that the English can take very grand furnishings and architecture, but still make it feel comfortable and we can actually imagine living in it on a daily basis. This house is strictly for entertaining, not living. srb, It certainly is a formal house, isn't it. that modern wallpaper in the 'office' (?) is pretty awesome as is the hidden tiled door in the bathroom to the right of the sink! Stefan, I also love that tiled jib door. Very clever! which wallpaper? I think all those walls are fabric. The "poppy" fabric I have been looking for my whole life!!! 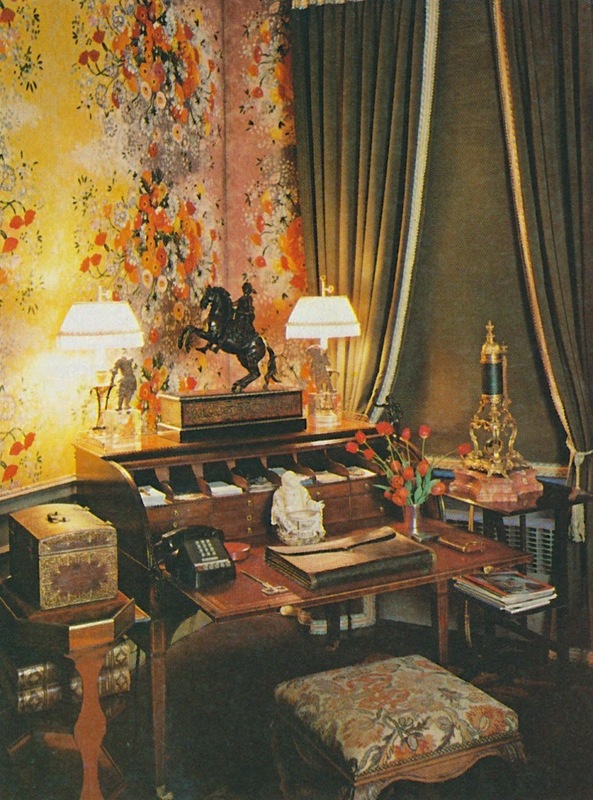 (and those of Susanna Agnelli's NY apartment) almost subversively refreshing. Today, I am not so sure about that assessment. Their boldness is commendable, but there are too many perverse elements, no matter the erudition behind them. Still, I imagine that it took real guts to work in a manner so very much at odds with the prevailing taste. 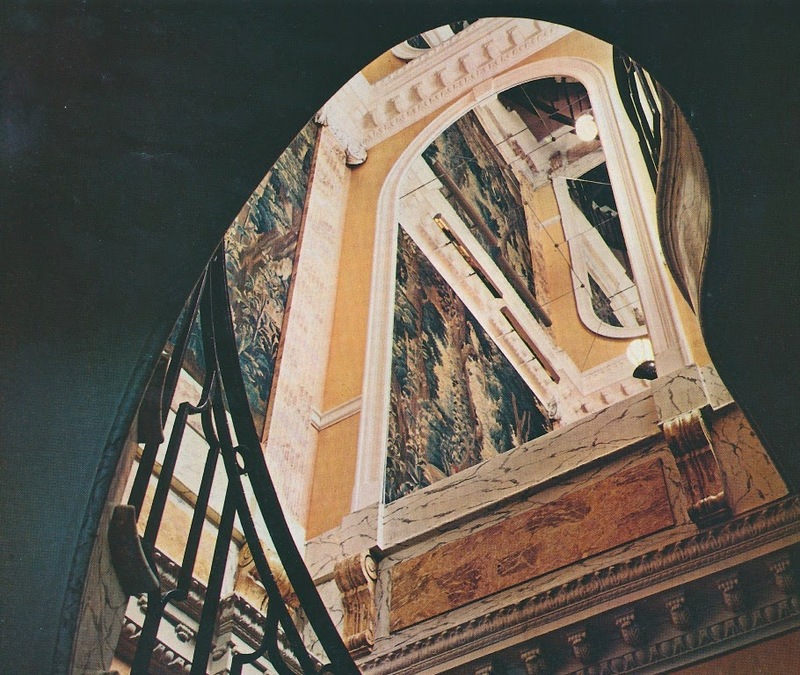 Slim Aarons took a marvelous photograph of the young Vincent Fourcade in the poppy-print walled library, long before the apartment was featured in AD; so it was always my impression that it was his particular aesthetic which shaped the DF style, and then Mr Denning absorbed it for better or for worse. Toby, I think that the Denning and Fourcade look elicits strong reactions from people. It's not a look that resonates with me, and yet, I can respect certain elements of it. Your choice of the word "perverse" is apt. And yet, however quirky or excessive their approach, it extended into realms hitherto the province of Jansen/Boudin. 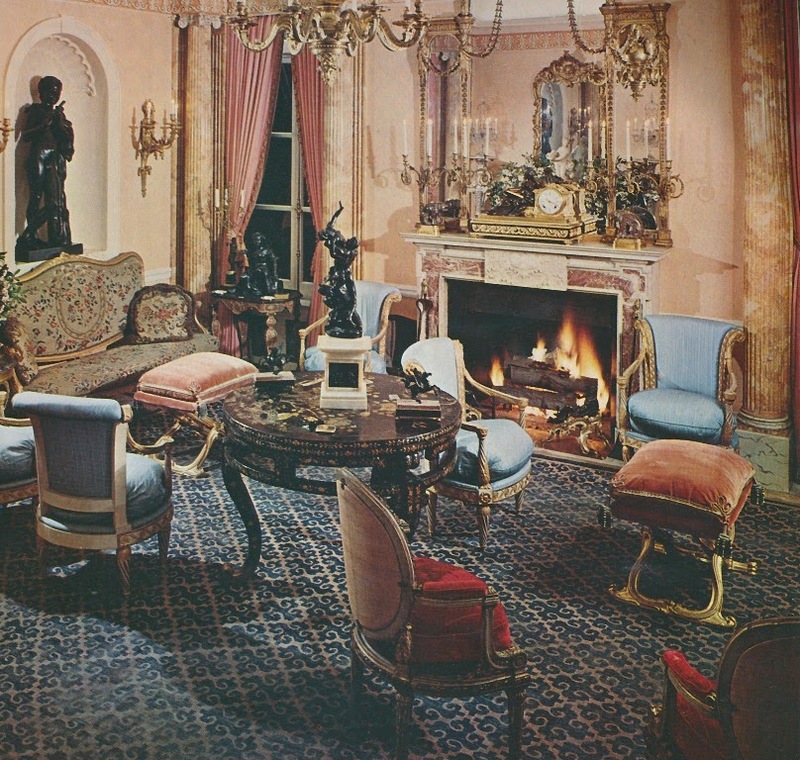 Take for example the Wrightsman drawing room in Palm Beach, where Jayne's 18c french chairs were covered in wildly patterned indienne cotton prints. 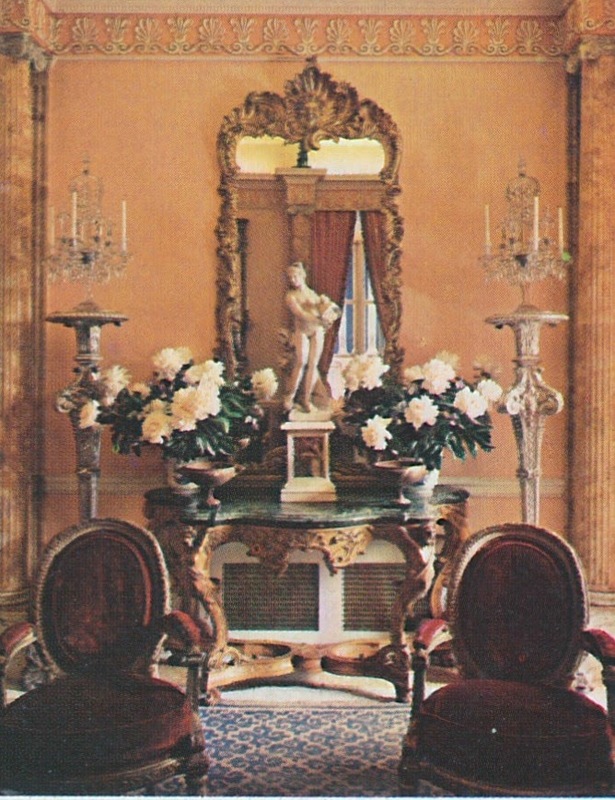 A far cry from the correctness of the Wrightsmans' New York rooms, which in itself might have been a pleasant change; but seeing those chairs in the auction catalogue is a reminder of how fleeting were the charms of the DF style. I have been trying to find this fabric since I saw that picture in Slim's book! Does anyone know if it is still made? I LOVE it!!!! Jennifer thank you for sharing these sumptuous Denning and Fourcade rooms! 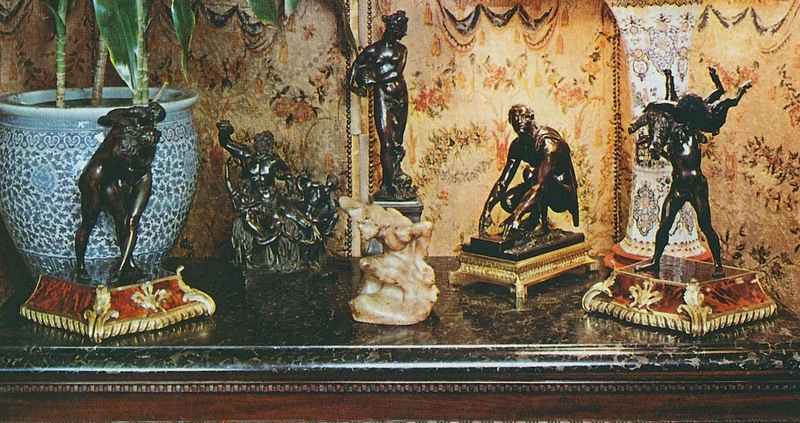 As in Howard Slatkin's Fifth Avenue Style, I always fine at least one special item in a room that completely resonates with me. Karena, Good point. With rooms that are densely decorated, one can usually find at least one element that is appealing. 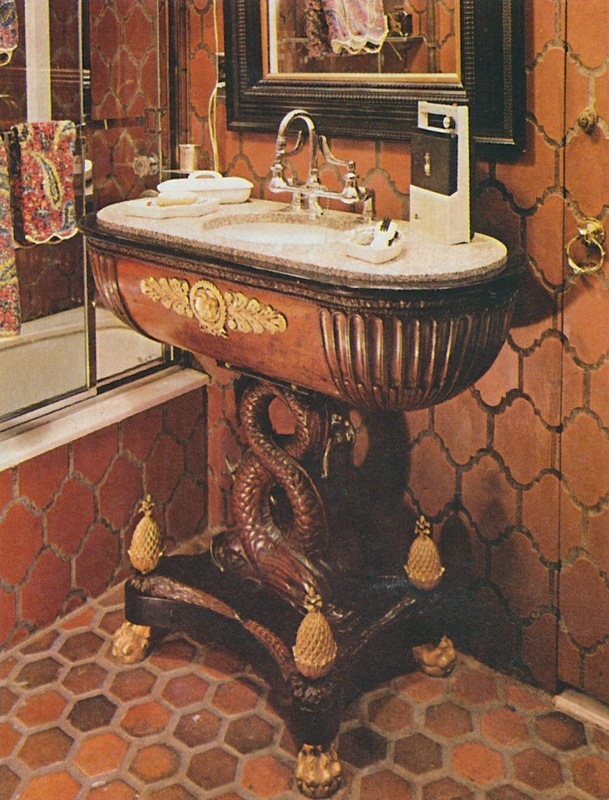 The antique furniture is divine. I would hope that fragments of this aesthetic will make a come-back. Mary, The antiques are wonderful! They were some of the first things that I noticed in these photos. The term 'dense' certainly does apply to these richly layered rooms. The mention of Howard Slatkin is perfect! As would be Alex Papachristidis and Michael Simon (is he still decorating? ).